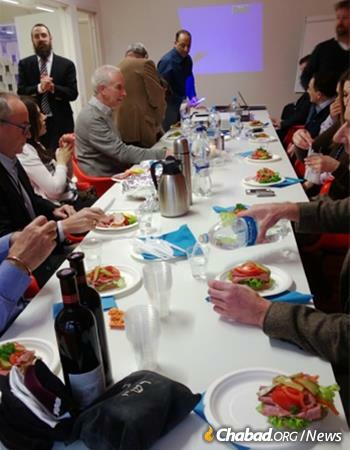 Rabbi Benyamin Wolff hosts a lunch for business leaders. As the world’s eyes turn toward Helsinki’s hosting of U.S. President Donald Trump and Russian President Vladimir Putin in one of the Finnish capital’s traditional summit meeting places, the Presidential palace, Rabbi Benyamin Wolff has his eyes set more on the building next door. Wolff and his wife, Frumma Ita, co-directors of Chabad-Lubavitch of Finland in Helsinki, have helped grow the city’s historic Jewish community over the past 15 years in the second northernmost established Jewish community in the world, sitting as it does in a Nordic country astride the Baltic Sea. In their latest advance for the Jewish community, they have purchased the building with the tony address — neighboring the palace — for its new home. Building on a Jewish community in existence for generations, the couple runs an ever-increasing myriad of programming for the estimated 1,300 Jews living in the Helsinki area. This includes ongoing Torah classes, a women’s circle, the Ganon Chaya Day Care Center, a Gan Israel summer camp, Shabbat and holiday services and meals, and clubs for Americans, Israelis and teenagers. 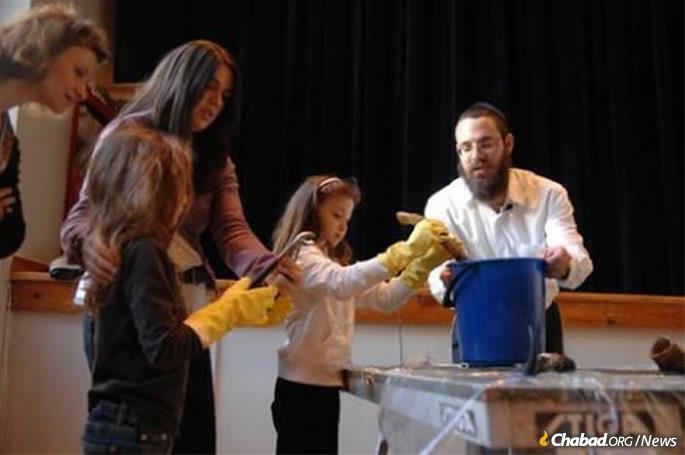 Their new Living Legacy Jewish Expo brings parents and children together once a month for hands-on crafts, games and activities. In fact, Finnish Jewish existence goes back to 1782, when one Jacob Weikman was recorded as the first Jew to live on Finnish soil, where Jewish residence for a time was banned. Community development accelerated in the early 20th century, serviced by two synagogues, The Helsinki Synagogue, erected in 1906, with a majestic Art Nouveau design, and on in Turku, with a similar design. A Helsinki Jewish day school was added in 1918 that now serves some 110 students, many of whom are children of Israelis working in Finland. A Jewish community center, built in 1961, includes a Jewish library of some 5,000 volumes and children’s playground. There one can also view a Sefer Torah casing made from copper from the first synagogue in the city, constructed of wood in 1840. Up until Finland’s independence from the Russian Empire in 1917, when Jews for the first time were granted full rights to be citizens, the country’s Jewish population was composed mainly of retired Imperial Russian Army conscripts known as the Cantonists. Forced into the Russian army in childhood and made to serve for 25 years or more, they were given the right to remain in Finland despite the original ban on Jewish settlement after their terms expired. Fast forwarding to World War II, the Finnish Jewry was largely spared the horrors of the Holocaust, in part due to the firm stand governmental authorities took against surrendering Finnish Jews to the Germans. A band of retired Finnish army veterans fought in the State of Israel’s War of Independence in 1948 in what is believed to be, at least proportionately, the largest contingent of European soldiers to help the Israeli war effort. The Wolffs at a shofar workshop, one of many programs for Jewish children in Helsinki throughout the year. Michel Grünstein, a fifth-generation Helsinki Jew, has witnessed the community’s development over the years, including the addition of the Wolffs’ efforts, doing largely what Chabad-Lubavitch emissaries do best, he said. Grünstein is firmly rooted in the old guard Finnish Jewish community, yet makes time to attend the Wolffs’ social gatherings, meals and study offerings, giving the couple good reviews on all fronts. This article was originally published at Chabad.org/News.